More than 500,000 hoverboards are being recalled because of fire hazards that pose the risk of injuries, according to the U.S. Consumer Product Safety Commission. The recall involves hoverboards from eight manufacturers/importers that are made with lithium-ion battery packs as well as 4,300 from Overstock.com and 1,300 from a store in Pennsylvania. Amazon.com is not listed in the recall, but in February, the online giant worked with the CPSC to offer refunds to any customer who wanted to return hoverboards purchased on the site. 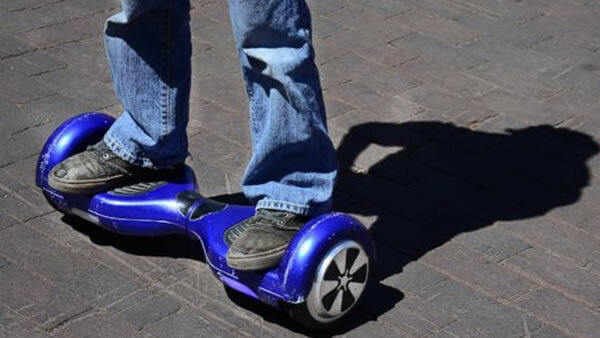 Hoverboards by Swagway make up more than half of those recalled -- 267,000. "We are urging consumers to act quickly," CPSC Chairman Elliot Kaye told ABC News. "We've concluded pretty definitively that these are not safe products the way they were designed." There is the risk that the battery packs in the self-balancing scooters, known as hoverboards, might overheat, start to smoke or catch fire, officials said. There is also a possibility of explosions that cause burns and property damage, according to the CPSC. Consumers should stop using the hoverboards immediately and contact the recalling company, officials said, and are asked to comply with safety standards to dispose of the scooters in a manner that is in line with state and local regulations. Almost 100 incidents have been reported, with some injuries and property damage, Kaye said. Consumers are being urged to get a refund, a repair or replacement part depending on the model hoverboard they currently own. "This is a huge recall. It's the recall we've all been waiting for to address this product that as soon as it came on the market presented a pretty significant fire hazard, and continues to present a fall hazard," Kaye said. The recalled hoverboards were manufactured in China and mostly sold by online retailers from June 2015 through May 2016 for about $350 to $900. "Overstock.com discontinued the sale of hover board self-balancing scooters early last December due to growing concerns about our customers' safety," a spokesman said in a statement. "At that time, we also contacted every customer that had purchased such a device from the website and offered them a full refund. Since that decision, we have not resumed selling the product on our website, and we will continue to investigate any new safety advances within the product category."